Laurent's crisp lines and woodgrain laminate surfaces reflect top quality and superb practicality. Total refinement is achieved with the subtle presence of beautiful radius edges. 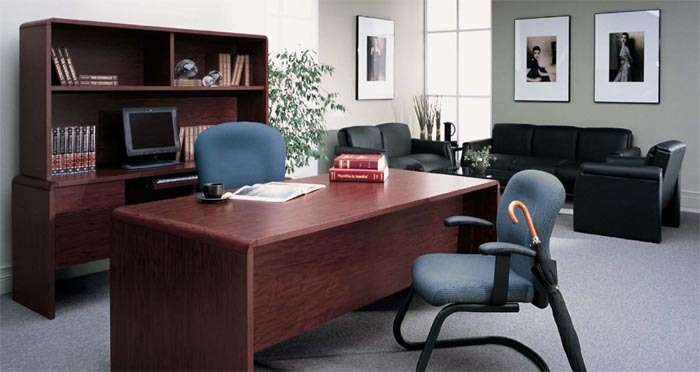 Whether you need a functional, task oriented work area or a stylish executive setting, Laurent offers the options necessary to create a perfect fit. The Laurent collection was designed to satisfy all your needs, even incorporating the warmth of a coordinating 2" radius edge trim. 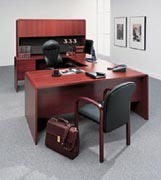 All box and file drawers feature steel ball bearing suspensions for trouble-free performance. Available in your choice of eight finishes. Locks are standard on all pedestals. Not only has Global kept your budget in mind, but your eye for style as well. Contemporary woodgrain laminate finishes have been selected to coordinate with today's friendly and warm office environments. Rich solid coordinating 2" radius edges soften the transition between top and side panels. Surfaces constructed of high performance thermally fused laminate. Recessed 3/4 modesty panel is standard. Full modesty panel option is available. Modesty panel is recessed 6" on 36" deep desks, 4" on 30" desks. Box drawers mounted on 3/4 extension steel ball bearing slides. File drawers mounted on full extension ball bearing slides. Drawers accommodate letter and legal hanging file folders. Drawer fronts are edge banded on all four sides. Locks are standard on all desk and credenza box and file pedestals, lateral files, storage cabinets and combination storage units. All lateral files feature a foolproof interlock device. Drawers open with side pulls and feature a french dovetail joint in front, lap joint in back. Shipped fully assembled, 1 to a carton, unless otherwise noted. Leveling glides are standard on all floor units. 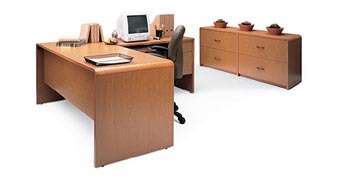 All box/file drawer pedestals, lateral files and storage units are standard locking. File drawers mounted on full extension ball bearing slides. Sculpted 2" radius edges define Laurent's aesthetic appearance.